Tor is really knocking it out of the park with these short novels and novellas they've been publishing recently. The Ghoul King is another good one. 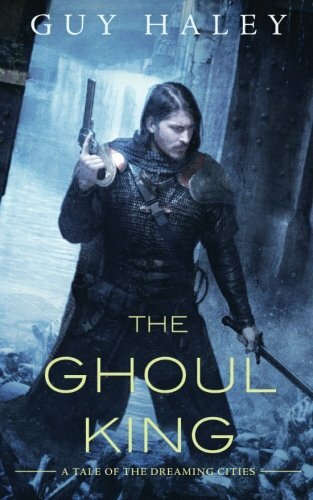 Told mostly in first person as a brutally truthful legal testimony given by a prisoner who got swept up in a rebellion, The Ghoul King manages to weave big-scifi post-apocalyptic ideas with the feel of an old pulp western and a really neat revelation story. In less than two hundred pages, there's a daring escape from a gladiatorial pit, a descent into a radioactive destroyed city full of mutated no-longer-humans, a Matrix-like reveal of the truth, and another daring escape after. It's a remarkably complex world for such a short book, but we get just enough of it in the story of their journey to want more without feeling jilted. This is a world that has lived through more than one apocalypse, and people are still living as best they can despite the overall weirdness and danger of what's left. It's a world where most people don't understand the technology of previous versions of the world because it's been outlawed, but some are trying to learn it again and apply it to helping people live better lives. It's a world where ruined cities full of ghouls also happen to hide secret information, and angels who aren't what they seem engage in various machinations. But cleverly, the point of view character, Jaxon, isn't interested in most of this. It's a risky choice, making the one telling the story interested more in helping people than in understanding what's happening to him, but Haley pulls it off well. It makes it so that all the grand opera of the scifi-apocalyptic-horror-western mashup is backdrop and setting rather than plot, and the story of this one mission is the point. He doesn't know what it means, but through his story, we can get to know the bigger story—and it's a neat hook. himself, and he's the mysterious man on a horse who comes to town and rides off into the sunset when he's done. Jaxon is the local who has his life changed by what happens when he gets swept up in the events in between. It's a classic set up that still makes for a strong story, even when all the set dressings have been changed and made creepy and strange. Layered over that is a classic scifi feeling that the science is big and awesome and world-changing—it's just itself layered under the apocalypses that have happened. It's almost as if the world itself is a result of the shifting trends in speculative fiction all bundled up together, and it's so cool. The fact that all this genre-play doesn't interfere with the story being told, and doesn't keep it from being fast and exciting, is a bonus. The Ghoul King is a quick read, a few hours of adventure and intrigue in a strange new world. Then as it settles in and gets mulled over, it opens up and implies more story beyond what was read—quite a feat and very satisfying. It feels open, too, a place where almost anything could happen and where there's still a lot of story to be told, and that makes it more intriguing still. This is one stop on Quinn's ongoing journey, and it's an interesting and absorbing one.